Online Dating: What is the ideal first date? Let’s face it, meeting someone from the internet for the first time is usually awkward. You don’t know much about this person’s mannerisms, how well they carry a conversation, or even what their voice sounds like in person. I think what you choose to do on your first date can help in big ways to make the two of you feel a lot more relaxed around each other. I’m not totally opposed to the dinner and movie date, but it’s a bit too conventional for me, and I don’t think it’s really the best choice for the first date. Imagine sitting down to dinner with someone you’ve just met and knowing within the first five minutes that you never want to see this person again. I imagine it could be painfully boring and awkward if you chose to sit through the entire meal, just waiting and waiting for it to end. I’ve kind of been in this situation before, and it’s not exactly pleasant. Instead of starting the date with dinner, I suggest choosing a fun, low-key activity to see if any chemistry is present between you and your date. If you immediately hit it off and want the date to continue, here’s your opportunity to suggest to your date that you’d like to go grab dinner. Also, I’d pretty much advise against seeing a movie or going to a music venue on the first date for obvious reasons. Your ability to converse will be limited, you may end up shouting at each other and asking fifty million times, “Huh? What’d you say? !”, and it’s much harder to read your date’s interest level if the two of you aren’t interacting much. Obviously, first dates should allow you and your date to spend a lot of time engaged in conversation, but I think there needs to be enough activity to help ease nervousness and/or mask the moments of awkward silence that may pop up. Basically, my best first dates usually involved lots of walking and talking. The other bonus about most of these date ideas is that they’re pretty inexpensive. And if you’re just not feeling it halfway through the date, it’s quite easy to excuse yourself without leaving your date sitting alone at the dinner table. I don’t intend for this to be a comprehensive list of all the things you can do. These are only a handful of suggestions that I consider ideal for the first date. 1. Go shopping. This was always one of my favorites, and it’s not just because I LOVE to shop. No matter what store you go into, you’re bound to find something ridiculous and silly that you and your date can make fun of. On my last first date, we initially met at a thrift store (it was my idea), and we had a blast. I’m sure some people probably don’t see the appeal of meeting in secondhand shops, but I am all for being silly on a first date. The mall can be a fun place, too. 2. Walk along the beach or a hiking trail. Just be sure it’s a public setting where other people will be present. 3. Go to the local fair or an arcade. Be like kids again. It’s a great way to let loose and have fun together. 4. Wander around downtown. Visit some shops you’ve never been in before. Go look at the historic houses. Grab ice-cream or a snack and take a stroll as you get to know each other. 5. Go bowling or shoot pool. You don’t have to be any good at either. It’s just all about having fun. 6. 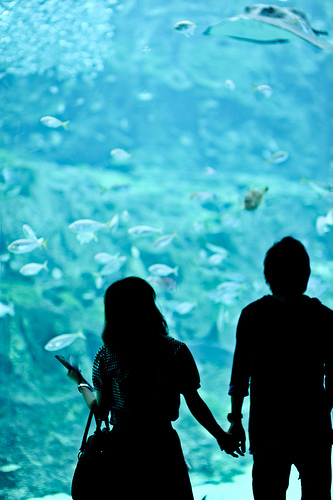 Go to a museum or aquarium. Not only can you have fun and get to know your date, but you might learn something educational, too. 7. Visit the local park. Have a picnic there. 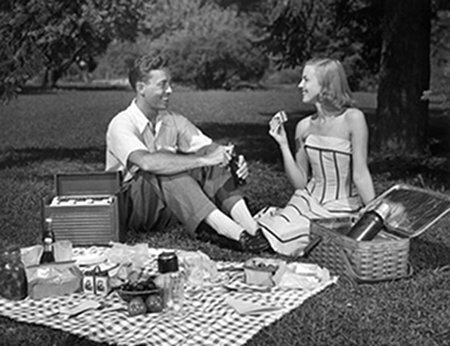 Picnics are very sweet and romantic. Feed the ducks. Take a walk. Sneak onto the playground equipment when you think no one is looking. 8. Create a silly challenge for each other. This can be a good way to break the ice. Before you meet, think of something that each of you can do during the beginning of your date that’s funny and maybe a little bit ridiculous. If your date has a good sense of humor, see how far they’re willing to go to make you laugh. Before our first date, I somehow got my boyfriend to agree to try on women’s shoes in a store. I laughed to tears and still have an awesome memory of our first few minutes together. Again, this list could go on. There are endless ways of having fun and exciting first dates that can relieve the tension and don’t require much money. Next time you’re wondering what to do for a first date, do something different from dinner and a movie. Consider some of these suggestions or try coming up with something on your own that’s fun and creative. After all, having fun and getting to know your date should be your two biggest priorities in the beginning. I created this blog to share my innermost thoughts and experiences as an INFJ conspiracy theorist loner, and I hope that I will be able to reach some like-minded souls in the process. If you think outside the box, are an introvert or sensitive soul, and are fascinated by topics such as spirituality and psychology, maybe you have ended up at the right place. Some people believe that there is no such thing as a coincidence. With that idea in mind, perhaps you have stumbled upon my blog for a reason. I hope that you will enjoy what you find here or are able to gain something from it. Shoegaze music and cats are just a couple of my favorite things. Take a look around, and please, feel free to comment! I love hearing from my readers and gaining new perspective through others' knowledge, ideas, and experiences! Join me in my pursuit of knowledge and truth.